Here are a few samples of the holiday pins I've been making for the upcoming sales. I've been incorporating lots of little birds, tiny pinecones, spun cotton mushrooms and miniature bottlebrush trees. 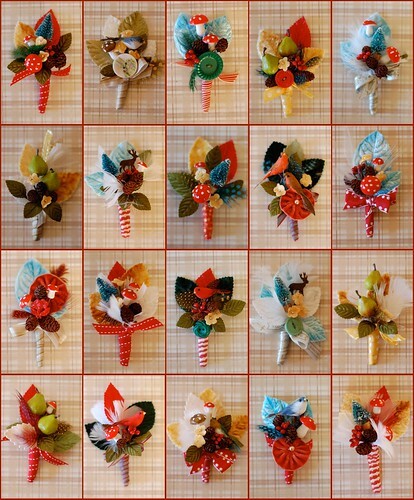 They are festive and fun, and perfect for your winter coat lapel. They also make great little package toppers. The first sale is Nov 13th and 14th at Kings Books in Tacoma. Please click HERE for more details. They're so beautiful! :) I'm sure you'll sell them all! I'd buy some if I weren't totallt broke :/. Will we be able to order these on Etsy if we can't make the sale? D and P - Thank you!! I'll see you at the sale! Looking forward to it. Laura -I'm going to try to list a few on Etsy,, but if I end up going to NYC to do the Martha Sale, I may not. I just put pics up of new ones on my flickr page. If you want me to save one for you, just make a note on the image and if you don't make it to the sale, we can work out something via paypal, and I can ship it to you. Hey, and if you want to do the TIFL sale, there are still a couple of spots. You can do Saturday and/or Sunday. It's a fun sale! I am having a non creative day and started googling around and came across your photos on MS. Beautiful. Truly beautiful and wonderfully original. I just voted for you and I hope you win!